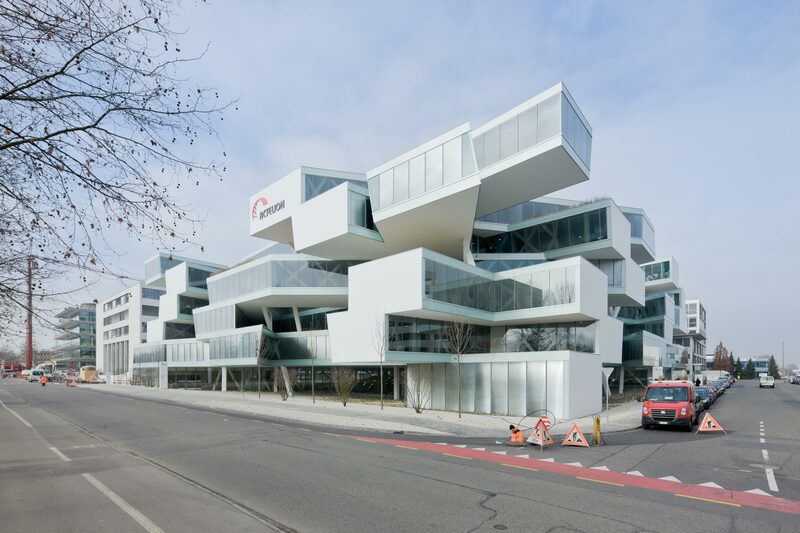 The new Business Center is the heart of the Actelion Campus in Basel. It provides space for 350 employees from the central function departments. The building stands for innovation and openness and thus represents the core values of Actelion. The building combines functionality and creativity and offers employees an inspiring working environment that fosters communication. The building consists of individual and open plan offices, an auditorium, a staff canteen, a central foyer and underground parking garage. Together with the Research Center in the south-west, the Innovation Center adjacent to the north-west and the new Clinical Research building the Business Center forms a self-contained functional unit. The energy concept of the building is based on the combined use of electricity, natural gas and renewable energy in the form of solar power. The aim is to provide the demand for heating and cooling in such a way that conserves resources for a largely carbon neutral building operation. 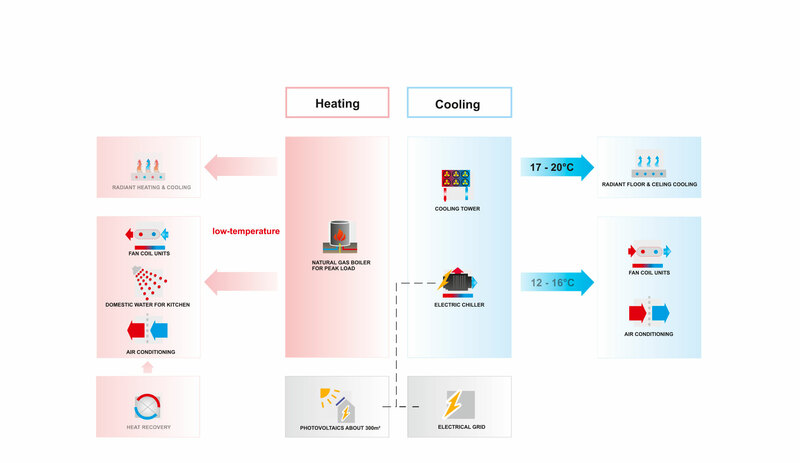 An essential component of the climate concept is the triple glazing that combines a high degree of an adaptive solar heat protection and a high degree of insulation. 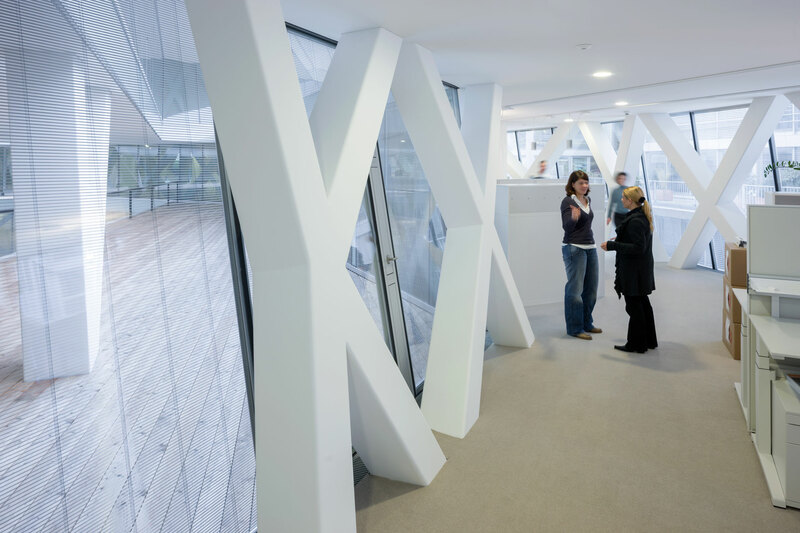 In the gap between the two outer panes are louvers for sun protection that automatically adjust to the position of the sun, but can also be controlled manually by the office staff. Each programmatic unit has individually openable window units. The glass facades are also designed in such a way that the exposed surfaces on the upper floors are inclined downwards to reduce solar gains. Thermal activation of the massive concrete ceilings is supported by individually adjustable fan coil units. The recirculation unit, integrated into the double floor, gets the exhaust from the ceiling and therefore runs at maximum temperature spread on the air side. To minimize vertical shaft areas, the mechanical ventilation is decentralized and has been implemented individually per floor. 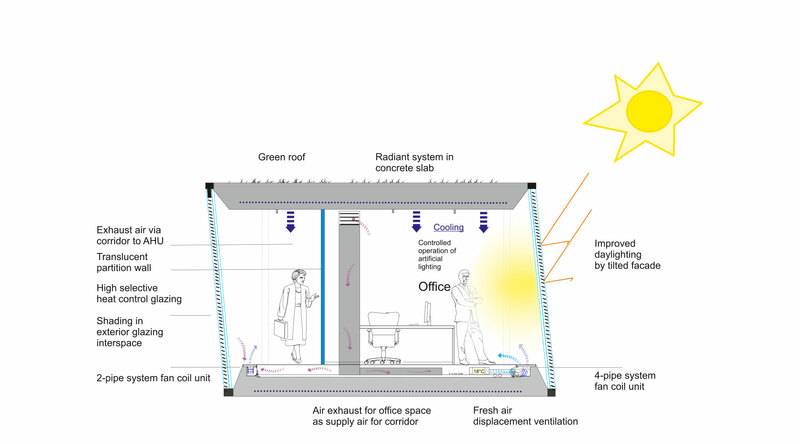 The exhaust air is transferred into the corridors and therefore ductwork can be completely foregone.